Our highly qualified and experienced dispensing opticians at Silverman Opticians in London can provide detailed unbiased advice on the best single vision spectacle lenses to suit your prescription without obligation or pressure. At Silverman Opticians, we supply incredibly thin and flat lenses that no longer ‘bulge’ from frames so that the choice of frames is not restricted by the strength of your prescription. We routinely scan patients’ frames to provide lens thickness calculations from different suppliers and our lens menu includes premium and budget designs to suit all pockets. At Silverman Opticians, we have a special Visi-Office machine to order lenses with ‘Eye code’. Eyecode is a unique breakthrough in lens personalisation and is at the forefront of innovation. Currently, all lenses that are manufactured assume every person has the same Eye Rotation Centre (ERC), when in fact it can vary by 30%. The dynamic 3D measurements, which can only be measured by Essilor’s Visioffice system, is based on pinpointing the exact Eye Rotation Centre that is unique to every person, delivering a truly tailored eye diagnosis, that is quick, easy to determine and highly accurate. Nikon’s new Bi-Aspheric ‘Seemax’ and ‘SeeStyle’ range of lenses are custom made to reduce aberrations and distortions that increase with high prescriptions providing excellent performance across the entire surface of the lens. The SeeStyle lenses can be made in extremely high curvatures which are excellent for wraparound sunglasses. Recently the range has increased to offer the ultra-high index materials with transitions. 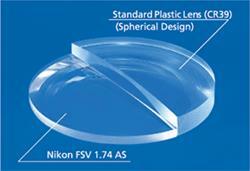 so that we can find the perfect lens for your requirements.